Recent biographies of Zora Neale Hurston, Angela Carter and George Harriman, among others, prove once again that truth can be stranger than fiction, writes Mary Ann Gwinn. Author Zora Neale Hurston is a goddess in the pantheon of African-American authors — her novel “Their Eyes Were Watching God,” based on her childhood in an all-black town in Florida, is a staple of reading lists from high school on up. Seattle author and artist Peter Bagge has outdone himself with his new graphic biography of Hurston: “Fire! 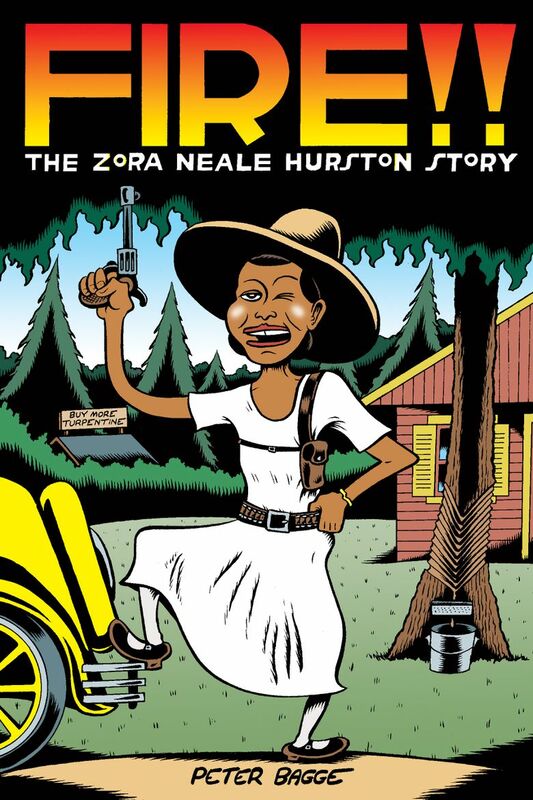 The Zora Neale Hurston Story” (Drawn & Quarterly, 104 pp., $21.95). Hurston led an exuberant life, and her story is a great match for Bagge’s comic style and contrarian point of view. She was a talented, educated and outspoken black woman in an age when none of that was an advantage. An anthropologist as well as a novelist, she boldly went into places hazardous to her health (such as the South’s notorious turpentine camps). She kowtowed to no one, including many of her fellow intellectuals, black and white. The book is split into two parts — the graphic biography is the first, but Bagge’s background explanations in the second half are just as entertaining. My sole complaint about this memorable book is that the 6 ½ x 8 ¾ inch format might be great for stashing in a backpack, but the required shrinkage of the type was a strain on my imperfect vision. Nevertheless, highly recommended. I bet Zora Neale Hurston would have approved. “The Invention of Angela Carter” (Oxford University Press, 525 pp.,$35) by Edmund Gordon was my introduction to this thrilling author. I’ve been carrying her stories on my smartphone ever since. To escape a smothering mother, Carter married early. Then she won Britain’s Somerset Maugham prize, which stipulated that a writer use the money to travel. She went to Japan — alone — in the 1960s, fell for the country and its culture, took two lovers and made her way there as an author and journalist. Her first marriage did not survive, and numerous romances littered her life until she met the considerably younger Mark Pearce. They had their first child when she was 43 and stayed together until her death from lung cancer at age 51. A wise friend and caring teacher, she was a mentor to writers such as Kazuo Ishiguro and Anne Beattie. Gordon’s biography works both as a portrait of a brilliant artist and as a fascinating social and literary history of England after World War II. The work of mystery writer Ross Macdonald has been experiencing a well-deserved renaissance — last year the Library of America reissued his novels in a two-volume set. There’s been a biography of Macdonald and a volume of his correspondence with Eudora Welty, a lifelong fan and friend. Macdonald’s creation Lew Archer was a loner with soul, a combination of private detective, amateur psychologist and savior to the Lost Generation and Summer of Love characters that peopled Macdonald’s books. The writer poured his dislocation, sadness and obsession with what made people tick into Lew Archer’s lifelong search for justice. Macdonald’s real name was Kenneth Millar. He was a brilliant boy who survived a scattered childhood where he moved (by his count) 50 times, raised by his Canadian relatives after his father left and his mother became a semi-invalid. Paul Nelson, a music journalist of the era (he wrote frequently for Rolling Stone), loved Millar’s work so much he tracked him down in 1976 and got him to sit for 47 hours of interviews, now collected in “It’s All One Case: The Illustrated Ross Macdonald Archives” published by Seattle’s Fantagraphic Books (301 pp., $44.99). Kevin Avery and Jeff Wong share the author credits; Jerome Charyn provides an introduction. Macdonald fans might be this book’s primary audience, but I like to think it would enchant anyone interested in Macdonald’s era. He was a cultured, literate and eloquent man who wrote about an era of tremendous social upheaval. The book, in a coffee-table format, is copiously illustrated with photos, book jackets and other ephemera from Macdonald’s life. Finally, two biographies already reviewed in The Seattle Times are worth mentioning again. “Shirley Jackson: A Rather Haunted Life” by Ruth Franklin, just won the 2016 National Book Critics Circle Award for biography. It’s the story of another outlier — in a “Mad Men” age of female repression, Jackson wrote everything from domestic memoirs to chilling psychological horror such as “The Lottery” and “The Haunting of Hill House” while raising four children with minimal help from her husband, literary critic Stanley Edgar Hyman. Michael Tisserand’s “Krazy: George Harriman, a Life in Black and White,” tells the story of the creator of the cartoon character Krazy Kat. Harriman’s hidden secret was that he would have been classified as black according to the race laws of the day, but his New Orleans mixed-race parents moved to Southern California so their light-skinned children could escape that burden. Tisserand masterfully analyzes the Krazy Kat cartoons, which continually drew from the well of the author’s divided soul. He appears at Seattle’s Elliott Bay Book Co. April 12 to discuss his work — well worth checking out, as is the book.